Automatic Auger type Powder filling machine is precision built on sturdy welded MS frame completely enclosed in stainless steel sheet and doors are provided to facilitate the servicing of machine. The auger powder filler unit is made compact, versatile and enclosed in stainless steel elegantly matt finish body. The dried, sterilized and siliconised bottles are fed through the infeed Turn Table on the infeed SS/Delrin conveyor belt at the required speed for feeding. 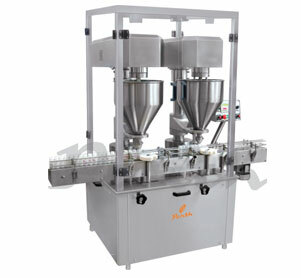 There are two Filling Heads and hence bottle reaches under the first filling head, it is held by the pneumatic bottle holder. Immediately it is be sensed by the bottle sensor and gives signals to magnetic clutch to start to rotate which is mounted on auger shaft. Auger type powder filling machine will fill the desired amount of powder to the bottle through auger, where rotation time is set in the Timer. After filling of first bottle pneumatic bottle holder releases the first bottle to move on conveyor. At the same time second bottle also moves along with the first bottle in empty condition. In the second filling head same operation is performed but this second bottle gets filled and first bottle moves further for next operation. Number of head 1 No. Electrical Specifications** Main Machine 1.50 HP / 415Volts / 50 Hz. Conveyor 0.25 HP / 415 Volts / 50 Hz. * Depends on Container size, fill size, Neck diameter of container, and nature of liquid etc. Accuracy ± 3 % in single doze. Body covered with SS sheet. All contact parts SS 316. A unit to fill variety of fine and granulated powder and can be used for various type of containers. Minimum change over time of change parts.